1. A dainty Princess Leia necklace to commemorate a lady who was actually tough as hell. Get it from Think Geek for $17.99. 2. A schoolbus of Hello Kitty collector pins that will brighten your textbook-filled, study-marathoning days. Hello Kitty predicts many A's in your future. Get the set from Sanrio for $39. 3. A delightful tote that'll make you wish you could eat tacos in space. Step 1: become an astronaut. Step 2: bring tacos aboard your next mission. Get it from Forever 21 for $1.90. If your taste buds prefer Chinese takeout and fortune cookies, there's a tote for those too. 4. Darling socks that will transform your feet into Disney princesses. No bippity, boppity, or boo required. Get five pairs from Amazon for $14.88. 5. A pair of kittens with nothing better to do than to hang onto your earlobes. Get them from Amazon for $18.50. 6. A steaming catpuccino for a double dose of caffeine and cuteness. Brb, melting into a coffee puddle. Get the pin from LindaPanda on Etsy for $12. Too busy to sit in a café? Here's a catpuccino to go. 7. Hollywood girl and modern art nail stickers for instantly stylish digits. Get the first sheet here and the second sheet here (both $8 from Soko Glam). 8. Plush bear claw gloves that will keep your hands warm while showing off your nails. 9. A pair of slip-ons with your favorite blubbery sea nuggets. You just call them manatees? Weird. Get them from Bucket Feet for $75. 10. A patterned elephant watch that'll go with any outfit. 11. A fuzzy unicorn graphic backpack that you'll want to pet for days. And carry your stuff around in, but that comes second. Get it from Forever 21 for $24.90. 12. A scrumptious egg and toast breakfast for your finger. 13. A cozy beanie that understands what is dearest to your heart. Even if they don't always think the same way back. Get it from Katie Abey Design on Etsy for $12.48. 14. Derpy earrings of Sanrio's laziest egg in his natural habitat. Get them from Modcloth for $24.99. This fried-egg Gudetama crossbody bag from Think Geek is also super cute! 15. A gentle elephant that will comfort you during rough times ahead. Get the necklace from Amazon for $10.99. Also available in gold and silver. 16. A pair of adorable pandas who are just the best of friends. Get the pin from Xoxo Designs by Ruth on Etsy for $7.49. 17. Soft pink socks for the ~sweetest~ monster around. Get a pair from Amazon for $10.65. Also available in cat monster, coffee monster, and shoe monster versions. 18. And speaking of sweet, these earrings also fit the bill. Get the set from Forever 21 for $3.90. 19. 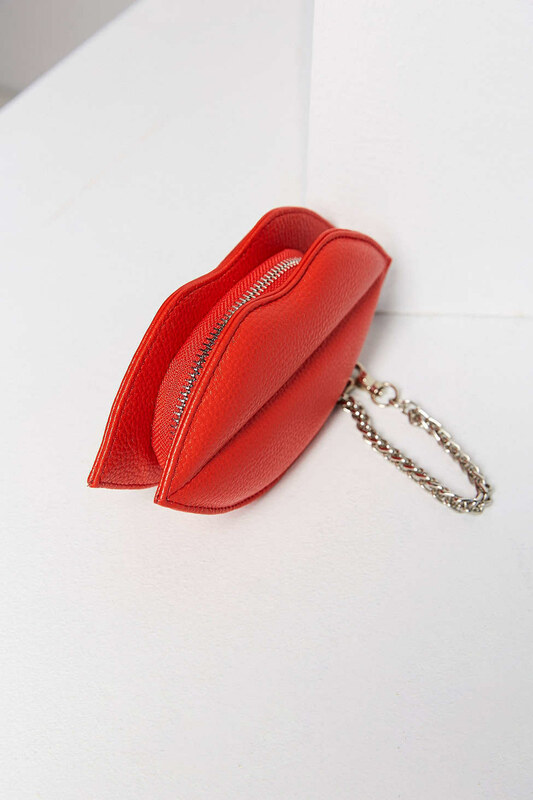 A tiny vegan leather pouch that's always ready to pucker up. Lipstick addicts, where you at? 20. Multicolored fox socks that will make winter a little more bearable. Get a three-pack from Amazon for $11.99. 21. Sunshine yellow flats that always greet with you with enthusiasm. Get them from Modcloth for $51.99. 22. A furry green llama that won't have any of your Blair Waldorf meltdowns. Get the pin from Jesiiii on Etsy for $20. 23. A just-peachy keychain of your most overused emoji. 24. A colorfully-outfitted dachchund that is well aware of its own charm. *yawns* Tell me something I don't already know, will you? Get it from La Cravette Du Chien on Etsy for $21.68. 25. A sequined faux leather crossbody with adorable bunny ears that just won't quit. 26. A wide-eyed kitty that will hopefully only bring good luck. Get the phone case from Nylon for $38 (iPhone 7). Also available for iPhone 6, and as a portable charger. 27. Essential pins for any dedicated mermaid-in-training. Get them from Modcloth for $16.99. 28. Heart-shaped sunglasses that tap into a more innocent IRL emoji look. Get them from Nylon for $55. 29. A scenic medallion necklace that will lend you major mountain wanderlust. 30. Shimmery velvet bow hair ties for an upgraded ponytail. Bow down to the ponytail queen. 31. An endearing cotton clutch depicting two elephants trunk on love. Get it from Iamfy for $32. 32. A charming origami dinosaur that'll stomp its way into your heart. Get the necklace from Modcloth for $35. 33. And a pup-sized hoodie for your furry, always-cold baby. Get it from Amazon for $10.99+ (available in sizes XS-XXL).